Its March, and that means its time for our favorite annual mainstream media math mess up: The February Existing Home Sales errata.As previously discussed, Home Sales are highly seasonal. Anyone with kids tries to avoid disrupting their school year when possible. And so, the ideal time to move into a new town (and school district) is prior to the start of the new school year in September. 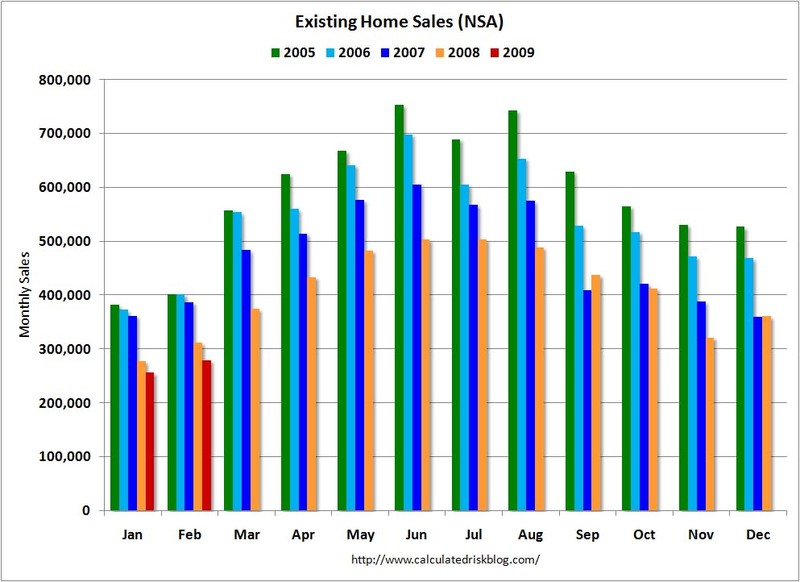 That factor, along with other annual holiday activity, explains the annual rhythm of the existing home sales. January is the worst month of the year for sales. From that low point, sales improve gradually for each of the next 6 months. They plateau over July and August, and then began heading down until December. This occurs year after year. For those people who actually want to understand the state of the Housing market, you have two options that avoid the cyclical seasonality: 1) You use year over year data. This removes the seasonal patterns by comparing January to January, June to June, etc. And 2) Compare non seasonably adjusted monthly data over the course of multiple years. Since the market peaked in 2005, we have been in a strong downtrend. Prices have fallen about 27% nationally, and units sales are off about 30% from the highs of over 7 million annual sales in 20056. There was one bright spot in the Housing data: Housing is now falling at a decelerating level. While year over year prices are still dropping double digits, unit sales are falling at a slower pace. Housing sales are getting worse, just not quite as quickly. The second derivative improvement suggests that we may be nearing a point where the unit sales may stop dropping. But that does not mean we are at a bottom yet, and it certainly does not imply a turnaround is at hand. Let’s take a quick look at two mainstream articles that have gotten this wrong: Today’s Investor Business Daily, and last years Wall Street Journal. Sales of previously owned homes unexpectedly rebounded in February from January’s record low, the latest evidence that housing — and the overall economy — may finally be hitting a bottom. The data does not show that Housing is hitting a bottom, it only shows that it is falling at a slower pace. Just because the parachute has deployed does not mean you are on terra firma. As to the overall economy bottoming, not only is there no evidence of that, but the leading indicators (ECRI, LEI, etc) all suggest the opposite: The economy is likely to get worse before it gets better. IBD is proferring an opinion, not facts — and its an unsupported opinion at that. Last, here’s why the word “unexpectedly” is wrong: The people who follow housing closely expected an increase in February. It happens every year, as the chart I showed yesterday revealed. And the March data will improve over February data, and April over March, and May over April and June over May. That is the seasonal pattern, and it is only unexpected by those people who are unfamiliar with the data, and simply do not know better. This especially applies to the NAR, who have been not just wrong, but wildly wrong the entire way down. Let me also point out that the economists on “Wall Street who expected a dip” are the same folks that did not understand the credit driven housing boom, missed the peak in sales and prices, and failed to see the housing collapse. They have been generally clueless about the entire economy for the past 5 years. That they were surprised by the same data they have consistently misunderstood and misinterpreted should be unexpected by no one at this point. A glut of foreclosed homes of historic proportions is starting to drive down U.S. home prices faster as lenders put more properties on the market and buyers show signs of interest . . . On Monday, new data suggested that pressures like these are starting to drive prices low enough to attract some buyers back into the market. Sales of previously occupied homes jumped 2.9% in February from the month before, the National Association of Realtors said, the first increase since July. No, the 2.9% was nothing special. It was the regular February increase from January. What is so amazing about this is that we see the same errors every year. And given how wildly wrong the usual pundits have been on this issue, one would hope the MSM would be a touch more circumspect.